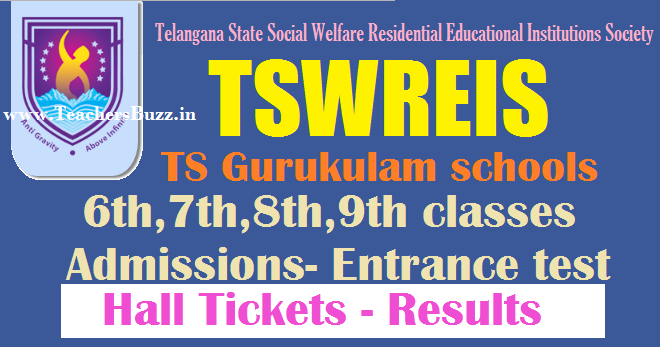 TSWREIS Admission Test for 6th,7th,8th,9th Classes Results 2019 |Telangana Social welfare Gurukulam Results, Merit List, selected candidatesTSWREIS Admission Test for 6th to 9th Classes Hall Tickets,Results 2019 |Telangana Social welfare Gurukulam Results, TSWREIS TS Social welfare 6th to 9thClass Admission Test 2019 Hall Tickets,results.Telangana Social Welfare Residential School Admission Entrance Test 6th,7th, 8th, 9th Class Entrance Test hall tickets Download at Official website http://swreishms.cgg.gov.in/coe/. New TSWR Schools entrance Hall tickets results 2019 Download. TS Social Welfare Residential Schools Common Entrance Test 2019 Hall Tickets.TS Social welfare Gurukulam Admission test results, hall tickets , TS Social welfare 6th Class entrance test 2019 Hall Tickets,Results, tswreis gurukulams class 6th admissions, online application form, last date for apply,hall tickets, results, certificates verification dates, Social Welfare Residential Schools Common Entrance Test-2019 for Admission into 6thClass, Telangana SWAEROCET 2019, Sixth class admission test hall tickets,results are provided here. 2. Mode of Selection is purely on merit basis through written test. 3. Admission will be given as per merit obtained in Telangana-SWAEROCET 2019. Test will be conducted on at the centre Name mentioned in the hall ticket at 11:00 AM. The applied candidates can downlod the hall tickets from the twereis official website www.tswreis.telangana.gov.in , http://cet.cgg.gov.in/Registration.do?status=getHT from -2019 and the Entrance test will be conducted on .2019 Timings: : 11:00 AM to 01:00 PM TS Social welfare 6th to 9thClass Admission Test 2019 Hall Tickets download from here.